Doing the warp trick you can also warp to within 100 KM's and place a bookmark. Warp out and warp in at 50 KM's to that bookmark to snipe the mission. All NPC missiles have a range of 80 KM's except for Zor so take him out first and then kite the rest. Golem or CNR should not be "recommended" ships. Very few players own a marauder or a faction bs. It's an easy mission , no overkill ship should be recommended to finish it. Mission done with an apocalypse t2 Therm/Kin + 1 eanm and a t2 LAR with a heat sink and t1 named beam lasers. The blitz didn't work for me. I had to kill 2-3 Seven Bodyguards (ontop of the HQ and Zor) until the mission objective was completed. The missing final trigger appears to be Seven Macleari. Bodyguard cruisers and frigates don't seem to trigger mission completion when killed. Will confirm in the next iteration. Anyway, I can confirm that I also had to destroy 2 out of 3 of the bodyguards as well as the HQ and Zor for the mission to flag complete. Every single time I do this mission I get completion after the headquarters, Zor, Macleari, the named cruiser and the Bodyguard which is closest to them. (That's 4 ships and 1 structure exactly.) Warp-cancel-warp to land right on top and it's the 4 closest ships every time. If you don't pick out the correct bodyguard right away, it will get mixed up with the others and then you'll have to guess which is the right one. I'm in Caldari space, mayhaps it's different elsewhere, but it's always identical here. I recomend the drake, it is pretty easy with tech 2 mods to protect the ship. I agree with BlasTerd about the over kill. I also agree that Tor needs to be taken out first, he packs a punch. Also, I used Therm and Kin for my missles and realized that the Kin damage I more idealy better for everyone but the 2 BSs, especially if you are using a Caladri ship who's damage revolve around Kinetic. Confirmed mission completion trigger. Kill Zor, Seven Macleari, the named cruiser and the Seven Bodyguard closest to Zor at the initial warp-in. You get about 10-15 secs to identify this cruiser and it's actually in the picture above (wrongly labelled as the named cruiser). Will be getting the pic replaced, as soon as Chepe checks the submit box. I'm not at all convinced by the suggestion to start with Zor, unless you happen to warp in close to him. When I tried this tactic in my Domi, some drones came under fire and had to be withdrawn, and in the time it took to do significant damage with my long-range ammo, I could have dispatched quite a few of the nearer rats. I think that would have reduced incoming damage faster -- especially given that I would have been webbed less and able to run away more! The drone aggro is from the frigs. I haven't tested in a while, but I presume you get almost full room aggro by starting with Zor. This leaves the frigs on the left and right side of the main group. Common sense dictates that for drone users, aggro the frigate group before releasing drones. As for killing Zor first, the tip does mention, if you're unable to bring your main weapons (i.e. your drones) to bear on him - kill any of the closest cruisers. Unless you just can't wait to blitz this mission and get out, Zor and the Outpost have had exceptional loot each time I've run it. Done in Hyperion with 8 x 425, 2 Tracking Comp, 3 x Cap Recharger, LAR, 3 Mag Stab, 1 x EANM and 1 x PDU, 4 Ogre II (Mainly t2 / faction stuff). Warp in at 100 (cancel and rewarp ofc) - auto aggro ensures they head for you. Pop frigs then a few cruisers until Zor is in range. Shoot structure to aggro remaining frigs. Easy mode. Did not need to use drones. I cannot describe the loot from Zor or the Outpost as excellent. The type and quantity are nothing special and about the same as any other loot from similar missions. Group 2 should be labeled as 2 groups since their aggro is not connected. At least it has not been the 3 times I have run this mission. If you only aggro one side then launch drones, the other side will aggro your drones. You need to aggro both sides of group 2 separately. I had to kill Zor first to lower the dps, after that I could safely tank with my raven. Get the outpost loot, it is awesome as is Zor's. I got a +3 Charisma Implant from killing Olufami. this mission currently (as of date of this comment) is not completable by a pure drone boat, (eg: a domi that has no guns equipped) since drones can not damage the outpost which one needs to destroy to complete the mission. granted, a level 4 mission runner is unlikely to not have the skills to get around this issue, so this is an fyi. i was doing this mission with thermal drones (hammerheads), and they could not damage the building at all. if i used turrets (lasers in my case) then i could easily hit the outpost. this seems really unfair to anyone that has focused on drones first. i had another account try, (ogres) and they had the same issue. i tried damaging the building with scouts, mediums, and heavys (using several damage types) none of them would work. 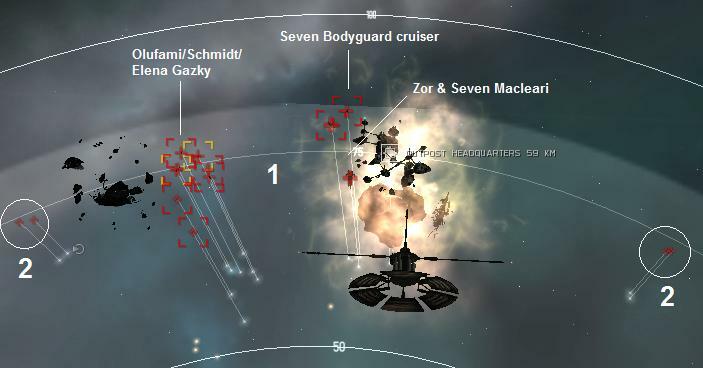 Saw your post on Eve-survival about drones and the structures in Right Hand of Zazzmatazz. I had a similar issue in Damsel in Distress, found that i could send them against a different structure then back to the one i wanted and they would start attacking. I just did Right Hand and had the same issue, but then sent them against the solar harvester and back to the outpost and they were able to destroy it. An annoying bug for sure, but i fly a ishtar mostly so drones do 90% of my damage. Sentry drones work OK on the structures. The problem with drones attacking the structure is because of the structure's geometry. It does not always work to send them back and forth so you must resort to guns. For Blitz, killing the named Cruiser (Schmidt and so on ..) is not needed - Zor, Macleari, closest bodyguard and Outpost is enough to complete the mission. I confirm the info from VaLTrantor. Target Painter worked on Zor for me, but ECM, Damps etc did not. That would make more sense anyway as there isn't actually a counter to Painting as such. Zor dropped a "Zor's Custom Navigation Link"+ the Hacker Card. A marauder may be overkill but that's the point-to grind LvL 4's FAST. The 100% tractor range and speed bonus really helps, (so does the 100% damage bonus LOL) Best 2.8 Bil I ever spent. Used this mission to test my Raven fit. It did fairly well. I wasn't webbed or scrammed once, but I did the WT100 trick, so the ewar frigs might notta gotten in range. I cannot get the "Warp to ___ km" to appear. have started and cancelled warp several times. Dropping a bookmark and choosing the "warp to within 100km" option doesn't work either. This "warp-cancel warp-warp to" things seems not to work with me. I clear this mission very easily with a T3 Tengu. Never got under 90% shield. Too easy to be honest. The aggro has been only partial. Just half fleet shooting at me. The warp-to at range has been fixed. I did the mish 4 times recently and always at range if 45-55km from Zor. The advise to take him out first still stands, then go for frigates (especially when you are a drone user, those frigs always target drones). I think the guys who made those rediculously overkill ship recommendations do so to artificially limit the competition. "Equip rat specific tank" I run 2InvulnIIs, 2LSEIIs, and 2LSRIIs;never adjust for facton and still survive just fine. "Equip faction specific ammo" My normal scourges work just fine, why invest in a hangar full of different types? Easy and fast in TII and dual Gistii B Tengu. ""Equip faction specific ammo" My normal scourges work just fine, why invest in a hangar full of different types? " 5) Turn back, kill wave 2. Completed in Caldari Navy Raven. Almost a challenge. Completed in less than 10 mins with Abaddon, very easy when warping to 100 and sniping. Easily done in a Myrmidon (T2 fitting - 2 x MARIIs, KHII and THII) - just make sure you get all the aggro from the frigates so they don't hassle your drones. I did the warp within 100 trick and the lookouts bugged out, would only attack my drones and reset every time I put them away. I'm not an old hand at this game, but even when I hit them with missiles they just flew back to their posts after drones were gone. Less than 7 min in a T2 Navy Apoc. Zor does most of the DPS (Cataclysm Cruise Missile). 673m3 of salvage. Easy mission. Did it np in my Maelstrom. Had no trouble killing Zor. 800mm Guns and 2 Therm 1 Kin hardner. Was cake. a trick i used that didn't require any thing special from a tank was a kite. i warped in at 100km and drew out my drones. all the ships targeted me and headed towards me. i set my default Keep At Range to 160km (warp distance with some buffer) then flew away until i was in warp range of the structure you have to destroy. all the mean while picking off the faster ships as they caught up. worked good and kept any conglomerate of DPS from being placed on me. warped to the structure when i could which left only a few ships left and finished it off (no blitz, go for bounties). Not sure if something has changed but I used kinetic heavy missiles on my Tengu and they ripped Zor apart in five volleys. To put it in perspective: many Serpentis BS'es require 6-9 volleys. Would be good if someone feels like checking out if his resists have changed or something. If you have the skills and turret damage to kill frigates fast (more than one per volley fast) you might find taking out all the frigates, launching drones and taking out everything else works well for you. Everything was about 60km away, so kill the frigates, get the drones out and kill the cruisers, then take out the battleships. Despite being an active shield tanker, I didn't turn the shield booster on and didn't drop under 75% shields: gank was definitely it's own tank. If you're in something that involves any speed-tanking you might find it better to sit still and pop the frigates, it will buy you an extra volley or two in case you miss one in fall-off, and a bit longer to take out some cruisers too. Dropped Zor's Custom Navigation Link but ALSO Zor's Custom Navigation Hyper-Link worth about 20kk. Did this mission at least 10 times and thats the first drop of something of real value. Found a +3 Optical implant while looting this mission. Just lost my Dual LAR Dominix to overwhelming damage - drones were being targeted a lot. All frigates except one had been taken out. The RAT BS's seem to go quite fast - they are suddenly very close and, with cruisers, doing tonnes of damage very fast - could not warp our quick enough. Light Kinetic drones (Hornet) seem to have no problem damaging the Outpost HQ. Completed in Vexor Navy Issue with strong armor resists, single MAR II and sentry drones (Warden I). Would have used Gardes, but their optimal is too short. As already mentioned above, the NPCs inflict significant DPS at short range, so kiting them is a good strategy if doing this mission in a cruiser. Easy and quick mission if you set your tank properly. Also watch out for drone aggro. Warped in at 70km. Took out group 2 easily. Started to take out group 1, starting with the smallest while heading away from them. Over time, Zorm, Seven Macleari and the cruisiers gained on me producing a lot of damage from over 100KM with Inferno Cruise Missiles. Managed to destroy them while using 1-2 reps and cap balancing.